The inspiration behind the birth of the Hong Kong Veterans must be accredited to Gerard Sharman. Gerard ran a social hockey team - the Cosmos. 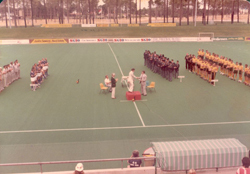 As a Perth man himself he witnessed an Australian Veterans Inter-State competition back in 1980 at the Perth Commonwealth Hockey Stadium. Also, in a separate triangular tournament, were the national veterans teams of Australia, Singapore and Malaysia. The latter represented by the Sultan Ahmed Shah's team (SAS). Gerard was determined to have Hong Kong involved. 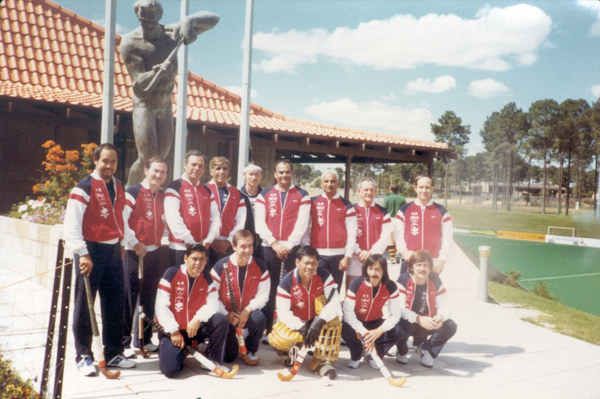 "The first veterans team to represent Hong Kong in an overseas veteran's tournament in Perth Australia in 1981." Back Row - L to R Jimmy Keir, Cristorao Santos, Gerard Sharman, Mohammed Iqbal, Tito Rodrigues, Zia Hussain, Khafiad Rahmani, Peter Corley, Ken Chambers. Front Row - L to R Jock Collaco, Gerry Prendergast, Slawee Kadir, Rui Silva, Allen Cullum. 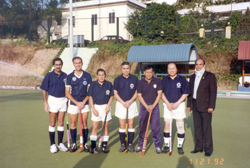 In 1981, when Con Conway was President of the Hong Kong Hockey Association, a representative team went to the games in Perth. Jimmy Keir was the Manager/player. Zia Hussian was Captain. Peter Kennedy, of Western Australia, on meeting us at 4.00 am at the air-port, commented, "Thank goodness you boys from Hong Kong have arrived. Now that we have a fourth nation we can soon be a true International." We were a triangular. Malaysia was not present. However, in 1982, again in Perth, with the four countries participating we could claim the first International and the start of the Pac Rim. On our first visit the Aussies admitted they were expecting a team of Chinese from Hong Kong and one that did not drink. They were soon mistaken. Instructions had been given to keep the beer mugs of our Aussie hosts always full to show our appreciation of their hospitality. We had been well looked after in various homes. "Open Ceremony of the First International Masters Tournament in Perth in 1982." During this tournament we observed several mature hockey players among the officials and spectators. An impromptu game was arranged between Australia and the Rest of the World. This was the first Pac Rim Senior Masters (50 yrs+) International. Peter Kennedy played for Australia. He was the driving force which led to the formation of the International Masters. He is now over 80 years old - and still plays hockey! 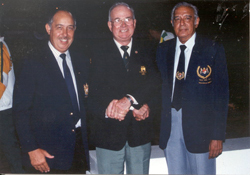 Ted Jones and Vernon Gooch Officiated for Australia. Left to Right: Jimmy Keir (Hong Kong), Ted Jones (Australia), Freddie Vias (Malaysia). With the Perth experience a meeting was requested of Krishan Lall, the new man at the helm of HKHA. Peter Corley and I sat with Krishan and told him of our intentions to start a Veterans section - with/without his approval! We got his nod, I nominated Peter as Chairman and myself as Secretary. This was in 1983. 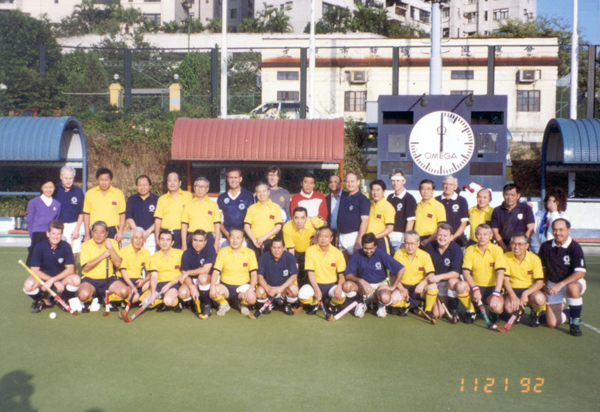 Visit by touring side to Hong Kong in November 1992. Hong Kong Senior Masters v Mita Hockey Club Japan at Kings Park. 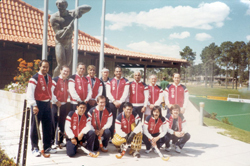 Both teams included Olympians who played for Hong Kong and Japan in Tokyo in 1964. 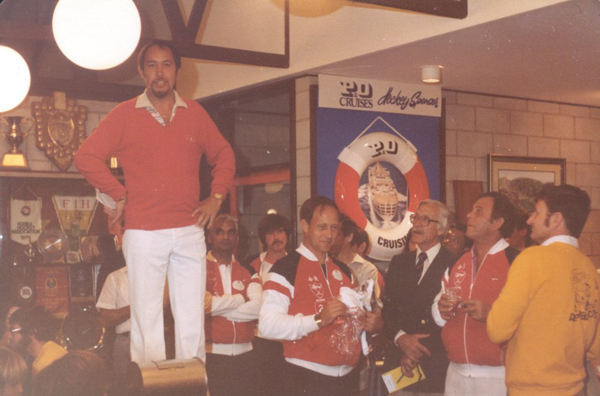 The following year it was our turn to host the tournament. We lost 21-1 to Australia at King's Park! I remember telling Graham Leeks, the Aussie Captain, "Don't lower your standards, we must raise ours." You can imagine my delight when in the 1991 Hong Kong Tournament the score between us was 0-0. The 1964 Hong Kong Olympians who played against Mita Hockey Club in 1992. Left to right: Sarinder Dillon, Eric McCosh, Jock Collaco, Kader Rahman, Slawee Kadir, O.K.Dallah, Zia Hussain (present but did not play). With Vets hockey so popular in Australia we had much to learn from them. They held inter-state championships from which they made a national selection. They travel with a Manager, Asst. Manager, Coach, Doctor, Physiotherapist, Masseur etc. They have total commitment. They have preached vets hockey by example and been supportive and understanding of weaker nations.